The biggest stars of the 61st Annual Grammy Awards turned out to be the celebrities who didn't show up. 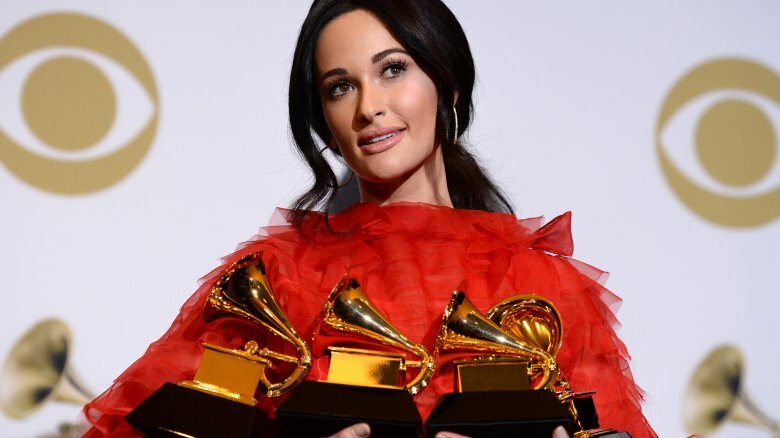 That's not say Kacey Musgraves didn't sweep the competition when Golden Hour scored album of the year (along with her three other awards) or that Dolly Parton didn't impress (because Dolly Parton always impresses). It was just overwhelmingly clear that the most interesting parts of the renowned event didn't happen on TV or even at the awards show. The Recording Academy did make some improvements from last year. They brought women to the forefront, which was more or less necessary after the disastrous comments from former Grammy president Neil Portnow (and the accusations of siphoning charity funds). Women actually won Grammys, too, including Dua Lipa, H.E.R., Cardi B, Lady Gaga, and St. Vincent. Still, Ariana Grande seemingly boycotted the whole thing, 21 Savage was in a detention center somewhere, Chrissy Teigen didn't even bother, and Donald Glover failed to accept his landmark win. Here's what happened where the Grammy's cameras weren't filming — from the stars stuck at home to the drama left best behind-the-scenes. The 2019 Grammy Awards were undeniably huge for Bebe Rexha. The rising star was nominated in two categories but still struggled to find a dress for the big day. In an Instagram post, the singer revealed that she had her team reach out to a number of designers, but a lot of them passed on making her a gown because of her size. "You're saying all the women in the world that are a size eight and up are not beautiful and that they cannot wear your dresses," she said in the video. "So to all the people who said I'm thick and I can't wear your dress, f**k you, I don't want to wear your f***ing dresses." According to People, Rexha is between a size six and eight (the average American woman is between a size 16 and 18). Not to mention, she's beautiful, down to Earth and one of the night's highest-profile newcomers. Following her Instagram statement, Jeremy Scott, Christian Siriano, and Karl Lagerfeld reached out to help dress the star. She ended up going with a red Monsoori princess gown that could not be ignored. "I want to have a Cinderella moment: I want it [the dress] to be so hard to walk in. I can't believe that I am finally nominated for a Grammy, two Grammys! For me this is my Cinderella moment," she told E! News (via People). Ariana Grande may have seven rings, but she only has one Grammy Award. During the 2019 ceremony, she took home her first Grammy ever when she beat out Taylor Swift for best pop vocal performance. Despite the big win, the starlet was a total no-show thanks to a reported disagreement with Grammy producers. According to Variety, Grande was invited to play the awards show but was "'insulted' when producers didn't want her to perform '7 Rings.'" They reportedly "reached a compromise" where Grande would perform the hit single as "part of medley," but producers would get to choose the second song. Instead, the starlet withdrew from the show entirely. Earlier in the week, Grande aired her beef on Twitter when Grammy producer Ken Ehrlich told The Associated Press (via The Fader) that the Sweetener star pulled out because she thought it was "too late to pull something together." 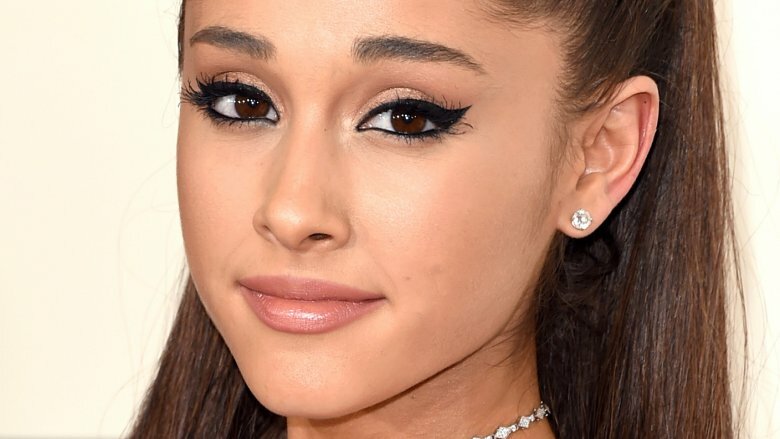 "I've kept my mouth shut but now you're lying about me," Grande tweeted in response. "I can pull together a performance over night and you know that Ken. It was when my creativity and expression was stifled by you, that I decided not to attend." Atlanta-based rapper 21 Savage was notably absent from his performance with Post Malone, who instead performed a solo set, followed by a duet with the Red Hot Chili Peppers. According to CNN, the Grammy Award-nominated artist was arrested by Immigration and Customs Enforcement in early February after the agency claimed the artist was a British citizen whose visa expired in 2006 when he was 14 years old. Since then, the singer has been stuck in a detention facility while the status of his deportation remains up in the air. The powers that be in the Grammy's ticket office apparently barred Savage's mother from the ceremony, too. The rapper's co-manager Justin "Meezy" Williams tweeted that the awards show wouldn't "release" the star's tickets to let Savage's mother attend on his behalf. "We won't be going to Grammys … the politics and sh** is ridiculous," he wrote, adding. "I won't blame this on race … I blame it on lame people being LAME." Savage was nominated for Record of Year and Best Rap/Sung Performance alongside Malone for their hit "Rockstar." 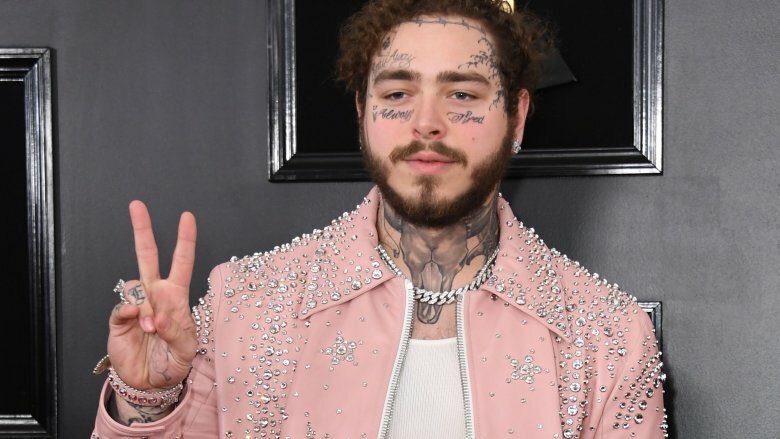 Post Malone's team spent a lot of time picking the perfect outfit for his Grammy performance and red carpet appearance. In an interview with The Hollywood Reporter, the star's stylist Catherine Hahn admitted they had a lot of "amazing options" but were still fine-tuning his look. "It's like a wedding! It's a once in a lifetime thing, so I want it to be iconic," she told THR. Malone ended up walking the red carpet in a millennial pink suit, but it was the outfit he wore backstage that really had people talking. 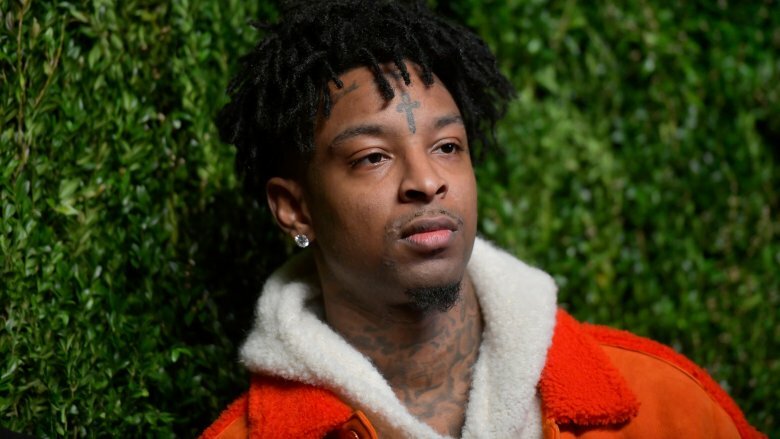 As we know, his "Rockstar" co-collaborator 21 Savage was stuck in an ICE detention center during the awards ceremony. Malone, who played two singles from his album Beerbongs and Bentleys before joining the Red Hot Chili Peppers, seemed to avoid all of Savage's parts during the hit, but he showed support where the cameras weren't rolling. A photo that surfaced from backstage saw the heavily-tattooed singer repping a black 21 Savage shirt. According to TMZ, this shirt was "presumably on him" while he played "Rockstar" without his pal. In the weeks before the actual awards ceremony, a list of Grammy winners allegedly leaked online. Talk about a spoiler alert. According to CNN, the tweet (which is obviously long deleted) contained a video that showed who won which category. Record of the year supposedly went to Cardi B's "I Like It;" album of the year supposedly went to H.E.R. 's H.E.R. ; and song of the year supposedly went to Lady Gaga's "Shallow." After the tweet seemed to catch wind online, the Recording Academy swiftly denounced it as illegitimate. Apparently, the winners are a closely guarded secret and even the staff aren't privy to who scores big. "Grammy Awards results are not shared, even with Recording Academy staff members, until the day of the Grammy Awards ceremony, when names of the recipients are delivered by [accounting firm] Deloitte in sealed envelopes," a spokesperson told CNN. So, does it check out? Well, Gaga may have won best pop solo performance for "Joanne," but "Shallow" lost out to Childish Gambino's "This Is America." Turns out, the whole thing was bogus. Chrissy Teigen made it clear she and John Legend (who now holds a coveted EGOT, which means he's won an Emmy, Grammy, Oscar, and Tony) weren't going to bother with the Grammys. Tweeting that Legend was reportedly "egot lazy," Teigen still managed to troll the whole event without even leaving her home. Before making fun of the televised performances (and the performers who get really into their performances), Teigen gulped down an alleged "four wines" and geared up with a not-going-to-the-Grammys makeup tutorial on her Instagram stories (in case anyone was "so bored you wanna die"). Teigen's tipsy tips included "put concealer all over your face" and "rub it in" while making sure not to care too much. She went on to do the painfully average task of brushing her hair while watching Below Deck, curling her eyelashes, and putting on mascara. Unfortunately, she realized she didn't have any lash glue which forced her to go for "casual at home vibes" (as if there's any other Grammy vibe the rest of us non-celebs are feeling). "If anyone is watching this … I pity you," she said. Seriously, Teigen, the pleasure is ours. 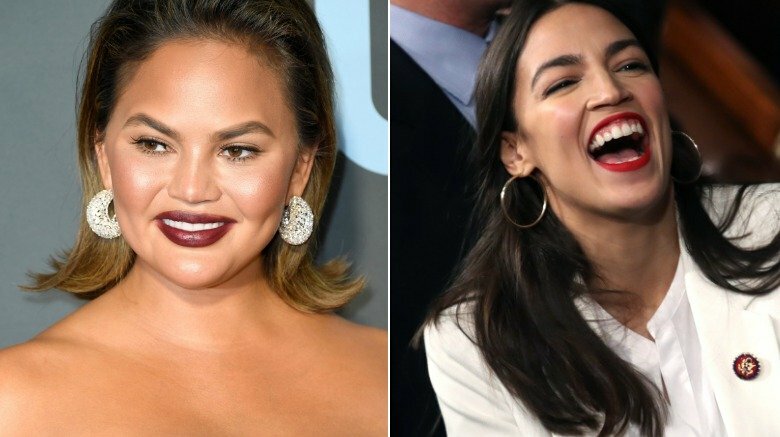 Though Chrissy Teigen had an epic time watching the Grammys from her couch, there was one major player who was absent from the low-key, ultra-exclusive party: Congresswoman Alexandria Ocasio-Cortez. How does she fit in? Teigen extended an invitation (and some slices of pizza) to the politician via Twitter. "Hello my hero, do you wanna come over and watch the Grammys with us? There will be pizza," she wrote. Basically, there's no friendship we could possibly 'ship more. Would they recreate the dance scene in The Breakfast Club? Would they plot a future presidential run? The possibilities seemed endless. Though AOC said "yes" and told Teigan she could live tweet her "burning something in the kitchen," it looks like the congresswoman had other plans (like drafting up a new climate strategy, retweeting SNL, planning to takeover the world, etc.). From the looks of Teigen's Twitter, the starlet's party was limited to actor Jesse Tyler Ferguson, comedian Neal Brennan, husband John Legend, and at least one of her children. Cardi B and Offset have been sparking rumors of reconciliation, but the pair made it red carpet official at the Grammys when they posed touching tongues. Yes, touching tongues. Is that okurrr? In early December, the "Bodak Yellow" singer took to Instagram to announce that she and the Migos rapper were calling it quits after a year of marriage. She claimed the pair "grew out of love" and things weren't working out, but the cheating rumors ran rampant. Not long after, Offset crashed Cardi's headline set at Rolling Loud asking to be taken back. According to Entertainment Tonight, he spent $15,000 on the flower arrangement, but she was visibly not about it (really, who wants their ex showing up at work?). Fast forward to the end of January, and TMZ reported that Cardi was trying to work it out after Offset allegedly swore off "groupies." He apparently even changed his phone number — and those of us who have had our number for decades know that's a big deal. HollywoodLife, who spoke to anonymous source, claimed Offset was working hard to specifically repair things before the awards show, and it looks like it worked. 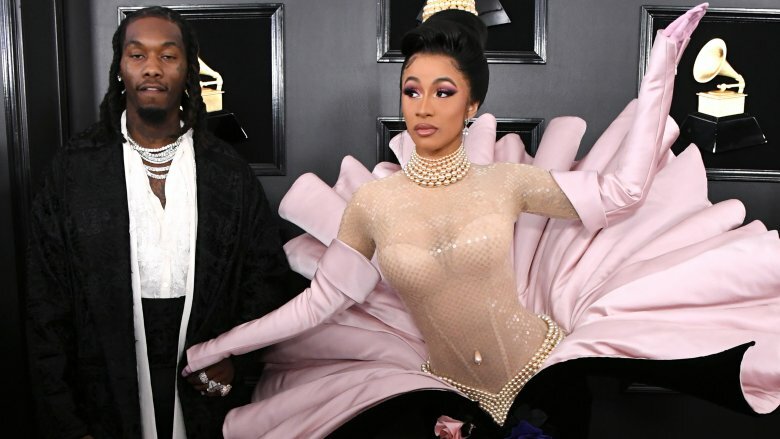 Cardi was looking totally loved-up with her estranged husband on the Grammys red carpet. How could Offset not drool watching her in that vintage Mugler gown? He looked like he was totally digging her performance, too. If you caught Young Thug's Grammy performance, you might have not known he almost didn't make the ceremony at all. According to TMZ, the star was cuffed hours before the event — and we're not talking about getting fitted with some fancy, custom cufflinks. While it's not clear if Thug actually got arrested, the rapper was pulled over with a group of guys in West Hollywood for a traffic violation. They were reportedly "handcuffed" and "lined up outside a McDonalds" after one of the men allegedly told a cop that he had a registered firearm; it just wasn't registered in California. The gun owner was arrested at the scene, and Young Thug was given the okay to go. Young Thug ended up winning big at the Grammys. 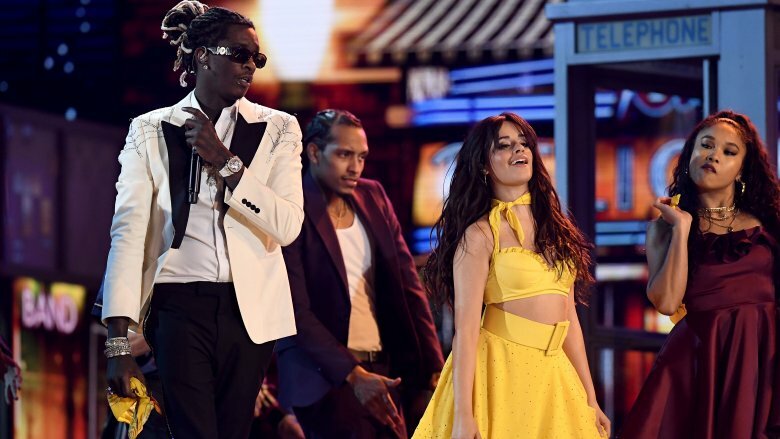 Not only did he have a stunner of a performance with Camila Cabello (shown above), he took home his first ever Grammy for his work on Childish Gambino's "This Is America." According to Deadline, the song won best music video, best rap/sung performance and song of the year. Childish Gambino's This is America also took home the award for record of the year. Was Donald Glover staging a boycott? Childish Gambino made history with his song of the year win. According to E! 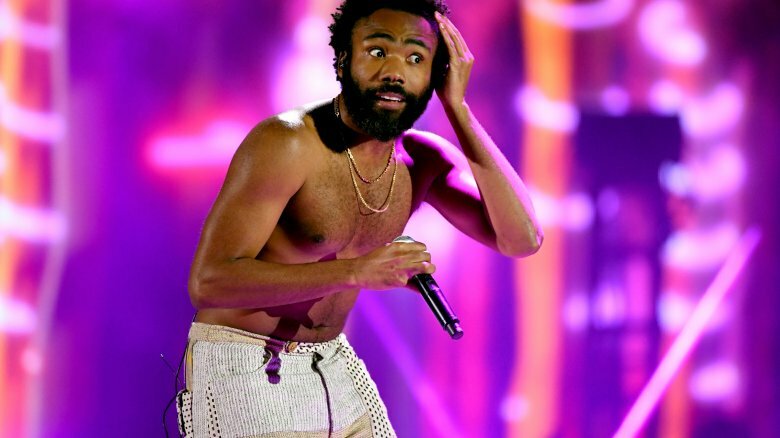 News, "This Is America" became "the first rap song to win the prestigious award in Grammy history", and Donald Glover was spotted around Los Angeles celebrating his nominations at some pre-Grammy parties. He even bleached his beard for the occasion; however, he was notably absent when it came to the actual awards show. According to The New York Times, Gambino joined a list of fellow rappers who were asked to perform but opted out. This includes Drake and Kendrick Lamar. The former spouted off a speech about how the Grammys don't matter and the latter didn't even show. Producer Ken Ehrlich admitted to The New York Times that the Grammys have a problem with some of hip-hop's biggest talent — including Kanye West and Jay-Z — because they've failed to take home the night's biggest prizes despite their nominations. TIME pointed out that Glover lost in 2018 after singing on stage. So, was his 2019 snub of the show political or was he just busy? Gambino ended up taking home four awards, including Record of the Year. Since he wasn't there to claim the prize for song of the year, John Mayer and Alicia Keys presented and accepted the award on his behalf.